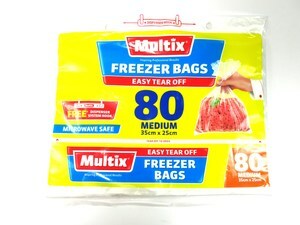 Multix Freezer Bags 80 Medium Easy Tear Off 35cmx25cm. Multix Freezer bags are the original and best freezer bag. Made from a high density material, the bags provide an excellent moisture barrier. Ideal for freezing and preventing freezer burn, just make sure to expel as much air out of the bag as possible before sealing it. Multix Freezer bags are a part of the Multix Dispenser System. Look out for the new Multix Resealable Freezer Bag with expanding gusset.